A majority opposes nearly all methods of torture. But among Republicans surveyed, 44% approve a complete ban now, compared to 68% in a 2004 survey. Six in 10 Americans approve of having an international convention saying that "governments should never use physical torture" as a means of trying to get information, while 39 percent say such a ban is too restrictive, according to a new WorldPublicOpinion.org/Knowledge Networks poll. A majority also opposes nearly all methods for coercing detainees to give information, even when it might be critical to stopping a terrorist attack against the US. Respondents were presented a scenario in which a detainee is being held who is likely to have "information about a possible terrorist attac k on the US that may prove critical to stopping the attack." They were then presented a series of methods for coercing the respondent to reveal the information. Majorities opposed forcing the detainee to take stressful positions (56%), using threatening dogs (64%), exposing the detainee to extreme heat and cold (66%), making the detainee go naked (71%), holding the detainee's head under water (78%), punching or kicking the detainee (80%), and applying electric shocks (81%).  <?xml:namespace prefix = v ns = "urn:schemas-microsoft-com:vml" /><?xml:namespace prefix = o ns = "urn:schemas-microsoft-com:office:office" /><?xml:namespace prefix = w ns = "urn:schemas-microsoft-com:office:word" />One method--sleep deprivation--received modest majority support (52%). Views were divided on putting a hood over a detainee's head for a long period of time, and bombarding the detainee with loud music. A very large majority (79%) favored offering detainees positive incentives for providing information. Further, even many respondents who say that a prohibition against physical torture is too restrictive do not want to eliminate the international norm against it. Asked whether "the international conventions on the treatment of detainees should be changed to allow governments to use physical torture," only 21 percent of total sample say it should. "Though other polls have shown that most Americans do not want to indict Bush administration figures for the interrogation methods used, a large majority does want to retain the international norm that bans torture," comments Steven Kull, director of WorldPublicOpinion.org. More broadly, three-quarters support the general principle of having "treaties establishing international laws governing how a country, in the context of armed conflict, must treat an individual it has detained," though "these rules limit what the US can do to detainees" as well as "what other countries can do when they detain Americans." The poll of 805 Americans was conducted May 27 through June 4. The margin of error was plus or minus 3.5 percent. Asked about the international convention against "mental torture, such as making someone think that they or their family members will be killed," 61 percent favor the convention while 37 percent say it is too restrictive. 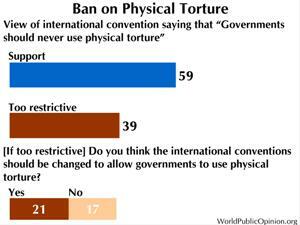 Just 23 percent favor changing international conventions to allow mental torture. Americans also overwhelmingly support giving detainees the right of habeas corpus. Eight in 10 support having an international treaty that requires that "detainees have a right to a hearing in which the government makes its case for why the detainee should be held and the detainee can challenge the government's right to hold him or her." Compared to polling conducted in 2004, there have been some modest changes, though the changes do not all move in the same direction and most of the change occurs among Republicans. The number favoring the ban on physical torture is down seven points from 66 to 59 percent, while those saying this is too restrictive has climbed from 30 to 39 percent. This is almost entirely attributable to an extraordinary swing in Republican views from 68 percent favoring the ban in 2004 to 44 percent today. Republicans saying it is too restrictive have risen from 31 percent to a majority of 55 percent, though only 34 percent of Republicans favor changing international conventions to allow physical torture. The number of specific coercive techniques that Republicans endorse is also quite limited and declining. Contrary to the trend in favor of allowing physical torture, in most cases Republicans have become more restrictive in what they regard as acceptable. Across the various scenarios, majorities support sleep deprivation (65%, down from 77%), hooding (63%, down from 66%), loud noise (57%, down from 66%), and stress positions (58%, unchanged). Views continue to be divided on using threatening dogs. For all other methods, clear majorities of Republicans oppose them, including 68 percent who oppose holding a detainee's head under water (though down from 79% in 2004). Steven Kull, director of WorldPublicOpinion.org, comments on these Republican shifts: "The sharp decline in support for rules against physical torture among Republicans may stem from concerns about the possibility that they may be applied against leaders in the Bush administration for the interrogation techniques they authorized. At the same time, they have grown more opposed to the actual use of specific coercive methods in the future." Another general trend is that opposition to using "mental torture, such as making someone think that they or their family members will be killed" has risen from 55 to 61 percent. This upward movement is mostly attributable to Democrats (rising from 61% to 70%). Curiously, Republicans are unchanged, so that now opposition to mental torture (53%) is higher than opposition to physical torture (44%). While three-quarters support the general principle of having treaties govern the treatment of detainees, this number is down from 88 percent in 2004. This shift is mostly due to a shift in Republicans. The poll was fielded by Knowledge Networks using its nationwide panel, which is randomly selected from the entire adult population and subsequently provided Internet access. For more information about this methodology, go to http://www.knowledgenetworks.com/ganp. It's depressing to that such a significant percentage of the populace is OK with torture. I feel fairly certain that torture is still fairly routine in our prison camps, it's probably just been redefined as "harsh interrogation technique", just as NPR has done. So, while the majority disapproves of torture, "responsible authorities" have inured themselves to the sentiment against it, so it goes.